In addition to our comprehensive material offerings, we also offer a variety of fabrication and converting services. Once you’ve consulted with our team of engineers and have decided on the mechanical and electrical properties that meet your application requirements, our material specialists can consult on our full range of fabrication and converting capabilities to complete the design of your components. Our CNC machining and converting capability includes mills, routers, punches, saws, drills, brakes, waterjet, lathes, cutting, and more. The Gund Company also builds custom fabrication equipment to meet the requirements of the most demanding customer applications. Our state of the art fabrication equipment and expert operations team can design and execute your custom parts with extremely tight tolerances. 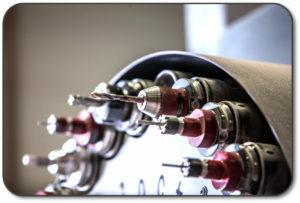 We have state of the art measurement equipment to verify quality and consistency of our processes. We also offer design to build and reverse engineering services in the event your engineering team needs additional consultative services. Our dynamic production scheduling system and industry leading responsiveness to customer requests allow us to optimize production scheduling to ensure our customers have their critical parts when they need them. If you need fast turnaround on a custom component or prototype, please contact an application engineering specialist today!